Here’s the secret for a richly flavorful vegetarian pasta bolognese. The thick, hearty sauce is filled with veggies like carrots and mushrooms. The wind was howling so terribly a couple of nights ago, it was actually rattling the windows. All of a sudden my computer screen went black. And the room dimmed. And my stomach sank. The winter storm had caused the power to go out. It was only 5:30pm but already dark outside, and now I’d have to find my way into the basement (via iPhone flashlight) to round up candles. Speaking of iPhones, mine was only at 30% and wouldn’t last me a lot longer. And speaking of 5:30 pm, I hadn’t even started dinner. This is what it means to live in the suburbs in New England in winter. The good news in this case is that just as soon as I had the panicked thought that we’d lost power for the night, it flickered back on. I went down to the kitchen to make my vegetarian version of pasta bolognese, because a bowl of comfort food is what’s called for on a night like that. 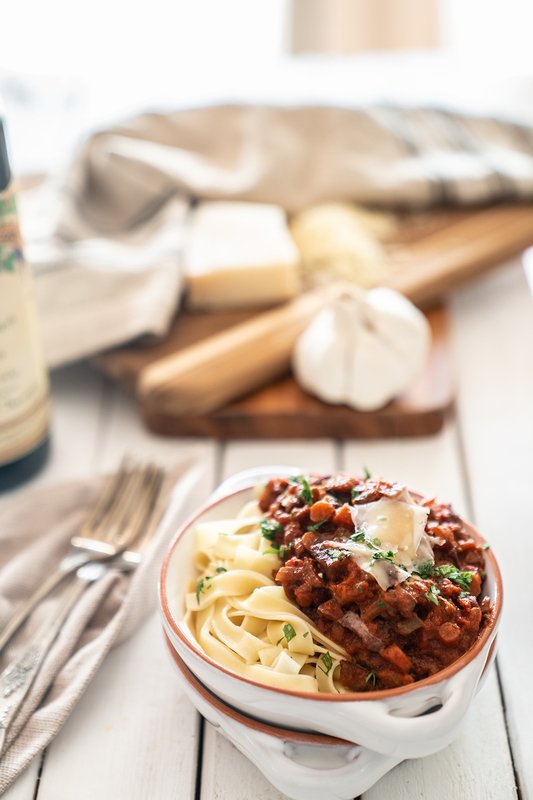 This version of pasta bolognese develops really rich, deep, savory flavors. I make this bolognese almost every week because it satisfies all of my cold-weather comfort food cravings. The veggies give it the same thick, chunky texture as a traditional bolognese. The chopped-up carrots, onions, celery, and mushrooms in this vegetarian version give the sauce lots of heartiness and texture. If you follow the right order, it’s possible to have this Pasta Bolognese on the table in about 30 minutes. Get all of the ingredients plus the equipment you’ll need (stock pot, sauté pan, large cutting board and chef’s knife), and put everything on the counter. Chop the carrots and celery and get those into the sauté pan with the bay leaves and olive oil. Fill the stock pot with water and start boiling it. Then chop up the onions, garlic, and mushrooms. Add those to the sauté pan. Then from there, follow the recipe directions (posted below) for the bolognese sauce. Check the package instructions for the cook time for your particular pasta and add the pasta to the boiling water accordingly. I buy and dice up pre-washed and pre-peeled carrot sticks (the kind you can also snack on). I buy packaged grated parmesan. Fill a large stock pot with water and bring to a boil. Season with salt, and add pasta. Cook until pasta is al dente, and drain. Heat 1 tablespoon of olive oil in a large sauté pan over medium-high heat. Add the carrots, celery and bay leaves and cook until veggies are softened, stirring frequently, about 5 minutes. Reduce the heat to medium. Add 1 tablespoon olive oil, garlic, onion, and mushrooms. Season with salt and pepper. Cook until the onions and mushrooms are softened, about 3 minutes. Add the oregano, honey, and red wine. Use a wooden spoon to scrape any brown bits from the bottom of the pan, and stir until everything is well combined. Simmer, stirring often, until the wine is reduced, about 5-6 minutes. Add the chopped tomatoes and 2/3 cup of parmesan. Stir until everything is well combined. Simmer until the excess liquid from the tomatoes is cooked away and the sauce is rich and thick, about 6-7 minutes. Remove the bay leaves from the bolognese sauce. Season the sauce thoroughly with salt. Add the pasta to the sauté pan, and stir until pasta is evenly coated in bolognese sauce. Transfer bolognese pasta to serving plates. Top with parsley (optional) and remaining parmesan. Serve.